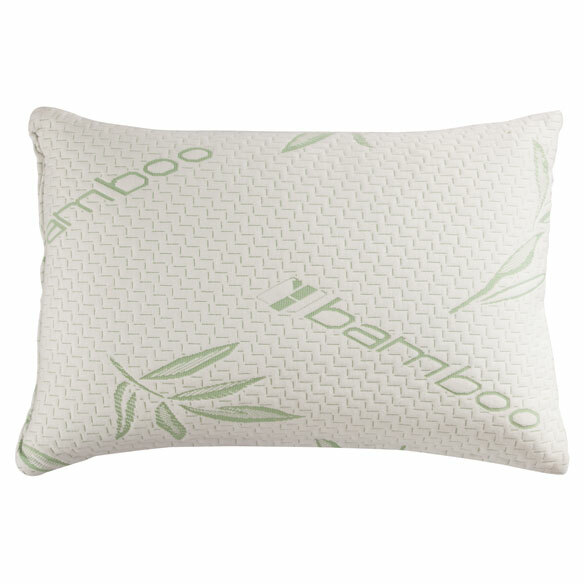 Rest easy on a memory foam pillow with bamboo breathability. Naturally renewable bamboo pillow is softer than cotton and helps you stay cool. Antibacterial, hypoallergenic pillow is filled with shredded memory foam for plush comfort in any sleeping position. 23 1/2”L x 15 3/4”W x 5 1/2”H. I ordered one of the Bamboo pillows a couple of weeks ago and I love it. Now i am getting one for my boyfriend because he said it was the most comfortable pillow he ever slept on. I heard a lot about the bamboo pillow and wanted to try them out. However, these were very hard. They were not like the ones I saw in the mall. I returned them for refund but id not receive the full purchase amount. Was not happy at all with the item nor return. My daughter has one and she said it is the best pillow she has ever had. She said it keeps her cooler at night and rests her neck. I'm having trouble with my neck, and it hurts a lot in the morning. This pillow is so hard, it was like putting my head on a rock. Used a similar one at my daughter's house. The pillow I am using now is not comfortable. !